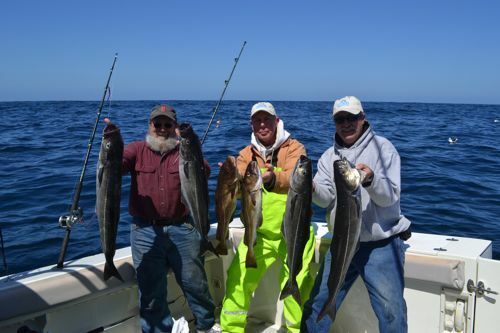 The 2013 Offshore Deep Sea Fishing Season began with a fantastic day of fishing! We reserve the first day of the season for an invitation only trip and this year’s trip was absolutely awesome. We caught pollock, cod, haddock and red fish on this trip and we caught a boat load. We even managed to hook a Sea Lamprey that managed to wiggle off the hook right at the surface. We had noticed that most of the pollock had circular wounds on them from the lamprey’s but none of the pollock still had one attached to them by the time we got them to the boat. It was a very very good day to be fishing and a very very bad day to be a fish. The majority of the fish we caught were pollock and we were catching 2 on the same rod at the same time all day long. The average size of the pollock was around 12 pounds and the largest weighed 17.5 pounds. The cod were biting steady and the largest was around 8 pounds. We caught 173 fish on this trip and had over 100 pounds of fresh fish filets. We also were seeing whale at a distance most of the time we were on the fishing grounds and on the ride back to shore. Everyone was catching fish on each cast and the photo to left shows a sample of what was biting. The ocean may look like it was a fairly calm day but we did have swells up to 8 feet but they were the slow rollers that actually help with the fishing. It was a great start to the fishing season and as always we really enjoy catching someone else’s fish! You can get in on this hot fishing action by giving us a call today @ 207.751.6966. At Maine Ocean Adventures we guarantee that you will catch fish. 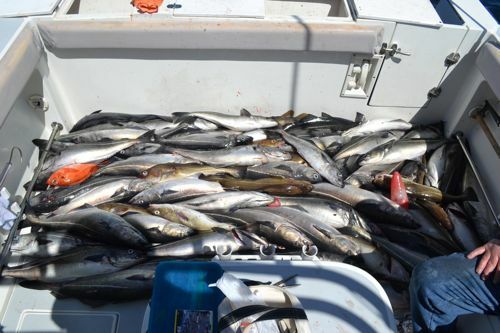 This entry was posted in About Our Boat, Maine Deep sea fishing, Offshore Fishing, Offshore Photo Gallery. Bookmark the permalink.